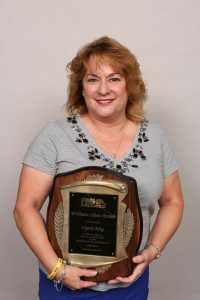 Lakeland, Fla. (October 12, 2017) – Cyndi King, Vice President of Operations, Blair Group, was bestowed the highest honor the Florida Manufactured Housing Association (FMHA) awards annually, the Williams-Olsen Award. The award was presented during FMHA’s Annual Convention held October 26-27, 2017 in Lake Buena Vista, Fla. Founded in 1947, Florida Manufactured Housing Association, Inc. is a membership-funded, not-for-profit organization whose mission is to advance the interests of the manufactured housing industry as well as those who seek reliable information on the many benefits of buying a manufactured home. Visit FMHA.org to learn more. © Copyright 2019 Blair Group. All rights reserved. Internet Marketing by Socius Marketing.